Compare some of the best disposable nappy brands using our customer satisfaction ratings for New Zealand baby products. Any parents reading this will be interested to know that our latest customer satisfaction award, for disposable nappies, has gone to Huggies. Changing your baby’s nappy is one of the least enjoyable jobs of parenting, but it is one of the most important. Being a mum or dad comes with great responsibility and that includes getting your hands dirty on a daily basis. 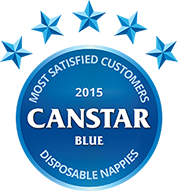 At Canstar Blue, we’re all about making your life easier; giving you insights into how other Kiwi consumers rate various goods and services before you buy them. So, any parents reading this will be interested to know that our latest customer satisfaction award, for disposable nappies, has gone to Huggies. The Kimberly-Clark brand has a solid reputation all over the world for providing quality nappies at a reasonable price, keeping your little boy or girl in good shape without too much damage to your hip pocket. Mums and dads in New Zealand are clearly impressed, too. You won’t be surprised to learn that parents are determined to buy nappies that fit their baby well and don’t need replacing every half an hour. The minimum requirement for any nappy is that it can fulfill its most basic duty of preventing your baby’s business leaking all over the place, but some do it better than others, according to parents. The feeling of getting value for money is clearly not too important to parents when they’re knee-deep in the task at hand. That being said, price is still somewhat important to parents when they’re out doing their weekly shop – our survey found 51% of mums and dads tend to buy nappies that are on special, while 34% have switched to supermarket private label nappies to save money. Speaking of being out and about, our survey revealed another interesting finding – that one in five parents refuse to use public baby changing facilities. It seems there are some nappy-changing issues at home as well, with 15% of parents admitting they resent their partner for not doing their fair share of the dirty work. It might come as a surprise to you that mums and dads feel equally aggrieved with their partners. What do you do with dirty nappies? Well, rather bizarrely, 7% of parents have been known to throw them in their NEIGHBOUR’S rubbish bin to avoid the bad smell. In this case, dads (16%) are far guiltier than mums (3%), we found. Back to the serious business now and ultimately it’s the nappy brand that strikes the perfect balance between fit, longevity and value for money will be onto a winner with parents. And this year Kiwi mums and dads have deemed Huggies to be No.1, with a near-clean sweep of customer satisfaction results. Huggies nappies have been taking care of babies’ bottoms all over the world for decades, and the brand says its latest nappy technology will keep your baby cleaner and drier than ever. In fact, Huggies claims to have the only nappies with tailored absorbency where boys and girls need it most – in front for boys and lower down for girls. Huggies also says its nappies are clinically proven to help prevent nappy rash. BabyLove says it has a strong commitment to providing innovative, high-quality products to parents and their little ones. The brand offers a wide range of nappy products to suit life stages – from newborns, to active toddlers, to their toilet-training stage. BabyLove promises absorbent products to keep your baby comfortable and dry. Supermarket chain Countdown has its own range of private label nappies which will generally cost less than their big name counterparts. Canstar Blue commissions Colmar Brunton using the SSI panel to regularly survey 2,500 New Zealand consumers across a range of categories to measure and track customer satisfaction. The outcomes reported are the results from customers within the survey group who have purchased and used disposable baby nappies in the last 6 months – in this case, 382 New Zealanders.